Chandler Brown is a 24-year old living with cystic fibrosis, a life-threatening genetic disease that primarily affects the lungs and digestive system. Over the last two years Chandler has been hospitalized three times, he’s had to go on oxygen, and his lung function dropped to 13%. In January, Chandler was informed that he was in need of a double lung transplant. Chandler has grown up in Greer, SC and graduated from Greer High School. He wants nothing more than to be able to live a normal life and get a job and be able to work like other peers his age. Chandler has tried to work several times but each time he would end up hospitalized. He has been through so much at such a young age — the decisions and struggles he has dealt with have been things no child should ever have to face. We are committed to seeing Chandler through this transplant towards a healthy and more normal future. Transplants are lifesaving but financially draining. 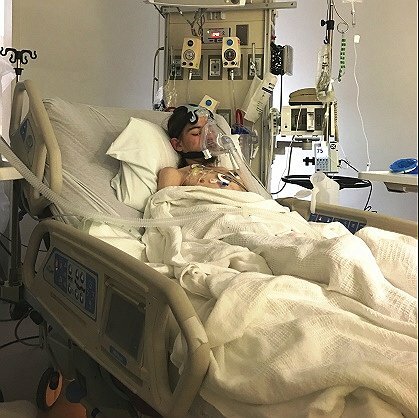 Chandler’s situation is complicated by rare bacteria, Burkholderia Cepecia, which requires him to travel to Cleveland Clinic to be evaluated by a specialized team of transplant doctors and begin the process of getting listed for transplant. For the evaluation, we will need to make several trips to Cleveland; one trip will be for a week. Even with insurance, Chandler is facing very high expenses in addition to travel for evaluation, including relocation expenses for up to a year to be closer to the hospital, post-transplant medications cost, caregiver expenses, and co-pays, lab fees and more. This is an enormous task and will be very demanding in every aspect on him and our family’s life. To help with the financial burden of Chandler’s uninsured expenses, a fundraising campaign in his honor has been established with Help Hope Live, a trusted nonprofit organization that has been providing community-based fundraising guidance to patients and their families for more than 30 years. All donations are tax deductible to the full extent allowed by law, are held by Help Hope Live in South-Atlantic Lung Transplant Fund, and are administered by Help Hope Live for transplant-related expenses only. Please consider a contribution. Nov 15 – Today Chandler had a Heart Cath done to determine the pressures in his heart. They pressures were elevated as they expected due to the heart working over time because of the poor health of the lungs. There was some fluid in the lungs which they said could take care of without any difficulty. Chandler was starved again due to being NPO since midnight last night. So he was excited to get lunch and enjoy it since he could not have his Mc Donald’s this morning. He is resting well. Please continue to pray. We have a lot to be Thankful for this Thanksgiving. 9 weeks ago today we received a call while we were driving up to Cleveland Clinic that Chandler’s heart had stopped. A few minutes later we received a call that they had gotten it restarted but there were complications. When we arrived they told us that Chandler needed a procedure to measure the brain swelling in his head and that he might no make it through the procedure. The next morning they told us that Chandler would not make it so we started to make funeral arrangements. Chandler had always said that if he could not have the a transplant then he wanted to be a donor and give someone else life. We met with the donation team that evening around 11 and filed out papers online, when we got to the bottom to sign the computer internet connection was lost and everything that should have been saved was gone. The coordinator tried 5 more times to put it in and every time it went blank. 1st sign God was involved in this decision. The next morning the head of the Nero ICU said some things did not add up with some of the test and he wanted to do another CT Scan of the brain. (2nd sign God was there) The other doctors did not see any need in doing this. My mom and brother and oldest son had flown up to say their goodbyes. I told the doctor that all God says we have to have is a mustard seed of Faith, and that we needed to do this CT Scan if there was any Hope he might come out of this. Well again we did not get the news we had hope for and as my mom and brother got ready to fly back home they said their last goodbyes to Chandler before leaving. As we again prepared funeral arrangements and met with the donor time I just had this feeling had we done everything we could for Chandler. The donor team worked all night to organize the organ donations to other hospitals and people. During this time we had people from all over the country praying for Chandler, and a sense of peace with us because of this prayer. Thursday morning was a hard one as we left Ronald McDonald House to say our goodbyes to Chandler. They had stopped all the sedatives and paralytic medicines the night before and the pain medicine that morning. As we got the hospital we saw the donor team and they told us that surgery was scheduled for 6:00 pm that evening to harvest Chandler’s organs, we said okay and proceeded to his room. When we walked into his room he opened his eyes as we walked in. God is GOOD. The doctors told us they were being causes because they did not know with the brain swelling what damage Chandler may have to the brain. As the day progressed Chandler became more responsive, but still not enough for what the doctors were looking for. So David and Shadoe took a break and went for a drive, while they were gone I just prayed a simple prayer. That prayer was – Father this is your child not mine, you have given him to me for a short time on this earth. I know I have not right to ask for more after what you have already done but the doctors need proof that Chandler is going to be okay. I will except what every you bring forth. Thank you for what you have already done in him life. In Jesus name I prayed Amen. I then sat down and began to work on my computer. Within the hour Chandler raised his arm. (3rd sign from God) I was not sure I saw what I had seen until he did it again to get my attention. I went and got the nurse and he asked Chandler some commands and he did what was asked. The nurse and I high five each other and shouted. All the nurse looked at us like we were crazy. He went and got the team of doctors. The entire team of doctors, nurses and therapist all came to Chandler’s room. Three doctors asked Chandler to preform some task and he did them all with flying colors. What a party there was at his bedside during this time. The doctors said that this does not happen. People do not come out of this, that it was a miracle. I say it is our Father in Heaven, and his timing, the true Healer. Never give up, a mustard seed of faith is all it takes to move a mountain or bring someone back from the brink of death. Chandler has been approved for double lung transplant, they have expedited the last little bit of testing for him to be listed. Once listed he could be transplanted within 30 days. So now we must raise the funds for transplant and living expense for while I am out of work with transplant. Thank you for all the support, God bless each of you. Please share this story. Update – Urgent prayers needed!!! Doctors will meet on Monday to make a decision on Chandler’s transplant. 8 weeks ago Chandler’s life change in a very dramatic way. He was not expected to live and today he is waiting on a chance to change his life forever and lead a more normal life. Please listen to His Radio Monday morning to hear Chandler’s story about God’s miracle in his life. Thank you for the support I will keep you posted. Chandler was at 85 lbs over Christmas due to bacteria call C-Diff that affects the colon and causes you not to eat or be able to keep anything you do eat. We almost lost him at Christmas. But he made a turn for the better and has now gained to 112 lbs. and is doing real well. Chandler has not been listed as of now due to the fact his weight and BMI was way to low to survive surgery. He now has a Bi-pap machine that helps with Breathing at night and he is resting and getting 8 hours or more sleep a night. We have had a second round of C-Diff in the last couple of weeks but caught it early enough to keep Chandler from losing to much weight. We hope to go back to Cleveland in June and that at this time his weight and all will be good and he will finish all testing for listing. Please continue to pray. Chandler has grown so much through all this, and we live for today and not what tomorrow might bring to us. Thank you so much for all your support. Chandler is being admitted to Medical ICU at Cleveland Clinic in really bad shape. We need transplant now if at all possible. Please keep him in your prayers. My husband and son, Chandler, have just left to for Cleveland Clinic in Ohio. He is at that point of no return in need of double transplant. This will be the first Christmas my family has ever been separated. It is truly hard to be separated during this season of Joy. Hopefully God will provide us with a true miracle this Christmas. Home from Duke, we will do a follow up Dec. 30th. We are home from Duke. Chandler goes back for Check up on 30th of Dec. Please continue to pray that the blood clot dissolves that is in his neck. Thank you for all the prayers. ANY DONATIONS are welcome and much needed. With two different hospitals this time and transport from GHS to Duke I am sure it will lots of $$$$$$$$$$$$$$$$. Please we are in need of donations to help cover our expenses while at Duke. Any thing will help to cover food, parking and all. I am staying in the room so that I do not have to cover the expense of a hotel. Please continue to pray. Tomorrow will be a busy day for trying to work on getting the port out and the blood clot removed or dissolved. Transfusion is complete and we will know results in the morning. Thank you again, please continue to pray. 3 days until we head out for Duke and the journey of a life time. Please share and donate if possible. Thank you for our family to yours. Still really having a difficult time. No strength to get up and get around. White counts up more now than it was when we started meds. Red count is down and carbon monoxide levels are up. Please pray. Starting back on steroids to try and help with breathing. Today is Chandler’s 23rd birthday and we are thankful for this. Strong young man. Please take a minute and look at Chandler’s page. We need your help in order to be able to do this with the lung transplant. Thank you so much for sharing. Update on how Chandler’s doctors appointment went today. Lung functions were down slightly but over all doctor was pleased with how he look and was doing. Hopefully she will be able to help us push Chandler’s Medicaid through for UPMC.